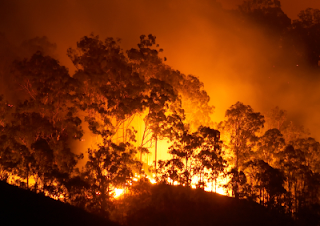 According to wildlife and forest conservationist Phillip Elden, the best way to prevent forest fires is to thin the land with controlled combustions. Though it may seem counterproductive, organized burning practices not only eliminate fuel for wildfires, but also makes the forest healthier from the ground up. It is not enough, however, to simply treat Forest Service land, says Phillip Elden. Private land and other public acreage must be thinned as well. It is only with cross-boundary work that the most widespread forest fires can be contained or prevented. Much of Oregon’s forest land has, at some point or another, succumbed to blazing fires. Phillip Elden points out the 3,800 acre wildfire which, in 1959, laid waste to the land owned by the Hoffman family, who lives on the outskirts of Ashland. In the six decades since that incident, the land has regrown with swaths of light green foliage from oak and other fast-growing trees and brush. Areas that have been spared destruction are dominated by dark evergreens and a thick, full, and soaring canopy. Planned fires, according to Phillip Elden, work to thin fallen branches and dry underbrush. He notes that the overall goal is to increase the diversity of flora to improve the canopy with a mixed range of conifer and deciduous trees. It is a significant burden to maintain woodland vegetation and it is up to the state as well as private property owners to ensure proper growing and burning measures are taken for the protection of the community as a whole. Phillip Elden describes fire as an all-consuming beast that knows no boundaries. It is especially important in years of significant drought to ensure that the land is prepared for anything Mother Nature might throw its way.